Jaipur is known for historic sites, museums, childrens museums, shopping, and nightlife. Your plan includes some of its best attractions: identify plant and animal life at EleSafari, step into the grandiose world of Amber Palace, take a peaceful walk through Grass Farm Nursery, and browse the exhibits of City Palace of Jaipur. To see reviews, ratings, and more tourist information, read our Jaipur itinerary planner . New Delhi to Jaipur is an approximately 2.5-hour flight. You can also drive; or take a bus. In November, plan for daily highs up to 35°C, and evening lows to 17°C. Finish up your sightseeing early on the 17th (Sat) so you can go by car to Agra. Kick off your visit on the 18th (Sun): step into the grandiose world of Agra Fort, then admire the striking features of Jahangir Mahal, then don't miss a visit to Jahangir's Hauz, and finally admire the striking features of Taj Mahal. For traveler tips, more things to do, and more tourist information, you can read our Agra trip planner . Traveling by car from Jaipur to Agra takes 3.5 hours. Alternatively, you can take a train; or take a bus. In November, plan for daily highs up to 34°C, and evening lows to 14°C. Finish up your sightseeing early on the 18th (Sun) so you can travel to Goa. Goa is known for beaches, historic sites, shopping, nightlife, and spas. Your plan includes some of its best attractions: kick back and relax at Agonda Beach, identify plant and animal life at Animal Shelter Agonda, tour the pleasant surroundings at Arambol Beach, and have some family-friendly fun at Milsim Goa Paintball. To see photos, reviews, more things to do, and more tourist information, go to the Goa trip planner . Traveling by combination of train and flight from Agra to Goa takes 7 hours. Alternatively, you can fly; or drive. Expect much hotter evenings in Goa when traveling from Agra in November, with lows around 29°C. Finish up your sightseeing early on the 21st (Wed) so you can travel to Thiruvananthapuram (Trivandrum). Situated among a collection of low hills that lead up to the coastline, state capital Thiruvananthapuram acts as a base for exploration of the southern tip of the country. Venture out of the city with trips to Kovalam (Kovalam Beach, Lighthouse Beach, & more) and Varkala Beach (in Varkala). The adventure continues: take in the spiritual surroundings of Sree Padmanabhaswamy Temple, step off the mainland to explore Poovar Island, don't miss a visit to Pazhavangadi Ganapathy Temple, and enjoy the sand and surf at Shanghumukham Beach. To see traveler tips, more things to do, reviews, and more tourist information, read our Thiruvananthapuram (Trivandrum) trip planner . You can fly from Goa to Thiruvananthapuram (Trivandrum) in 5 hours. Alternatively, you can drive; or take a train. November in Thiruvananthapuram (Trivandrum) sees daily highs of 36°C and lows of 28°C at night. Finish up your sightseeing early on the 24th (Sat) so you can go by car to Alappuzha. Step out of Alappuzha to go to Kottayam and see Vaikom Mahadeva Temple, which is approximately 1 hour away. Spend the 26th (Mon) exploring at Kerala Backwaters. And it doesn't end there: kick back and relax at Marari Beach, explore the activities along Punnamada Lake, and stroll through Andhakaranazhi Beach. To see maps, more things to do, other places to visit, and tourist information, read Alappuzha trip planner . Drive from Thiruvananthapuram (Trivandrum) to Alappuzha in 2.5 hours. Alternatively, you can take a train; or take a bus. In November, daytime highs in Alappuzha are 37°C, while nighttime lows are 28°C. Finish up your sightseeing early on the 27th (Tue) so you can go by car to Kannur. Kannur is known for beaches, historic sites, zoos & aquariums, nature, and wildlife. 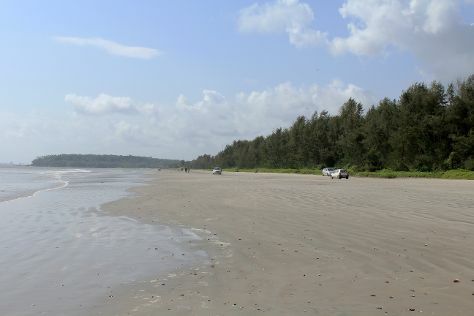 Your plan includes some of its best attractions: enjoy the sand and surf at Muzhappilangad Drive-in Beach, take some stellar pictures from Alakapuri Waterfalls, tour the pleasant surroundings at Choottad Beach, and step off the mainland to explore Dharmadam Island. To see traveler tips, maps, photos, and more tourist information, use the Kannur trip itinerary planning app . Drive from Alappuzha to Kannur in 5 hours. Alternatively, you can take a train; or do a combination of bus, flight, taxi, and train. Finish your sightseeing early on the 30th (Fri) to allow enough time to travel back home.